The Ancient Netminder: Let Me Try That! This is my pal Brian. He isn't a goalie. Brian is a solid player. 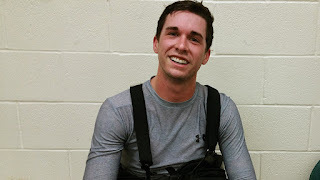 He skates well, scores goals and is a great teammate. He's fit too. In fact, in the world of beer league players he is likely in top 10%. Mind you the vast majority of us like drinking beer more than visiting a gym and some us have trouble getting out bed the day after a game. Brian is a fit, athletic and strong player. Brian wanted to try being a goalie and I happened to be there for the Christmas morning Stick & Puck at which he suited up. How long have you been thinking about trying to play net? In the last year or so. I really started to think about it more seriously when our goalie wasn't able to show up one night and someone had to draw the short-straw. I didn't get the chance to play that night but it stuck with me. Can you describe what getting dressed was like? I felt like a mite who's mom or dad was in the dressing room helping them get dressed. 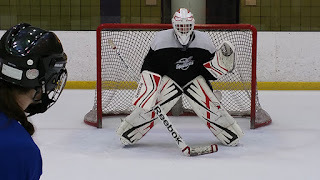 Some of the pads I had seen before, but things like the extra set of knee pads were new to me. It actually wasn't that bad, and was much quicker than I thought, but it certainly takes some effort. How did you feel getting ready to go on the ice? I was much more confident in my natural athletic ability to make at least a couple of saves before I actually strapped on all the gear. Once I was dressed, I thought "I hope I'm able to actually skate with all of this on." I wasn't really nervous to have pucks hit me, thankfully, because that seems like it could be big barrier to actually being a netminder. "I've seen goalies on TV"
What was your experience being on goalie skates the first few minutes? They're definitely different, that's for sure. I got around on them OK . I just cruised around to get a feel for being on the ice with different skates and double the gear. Not having any rocker radius was tricky. Once I was in the crease, I felt a lot less nimble than I am on player skates. Where did you learn your stance? TV, NHL video games, watching other goalies on teams I've played on, basically everywhere except any type of formal training or even tips from people that knew more than me. I play goalkeeper in soccer, so I had a pretty good understanding of positioning myself between the object used to score, and the yawning net behind me. What were your feelings facing the first few shots? Honestly, frustrating. Even though the people shooting on me were trying to give me nice, easy cupcakes to stop, I felt myself almost forcing a save attempt instead of letting the pucks come to me. It was pretty exhilarating though to have that frozen rubber flying at me. What did it feel like making saves or seeing the puck go by? Making a save was awesome. I didn't make anything spectacular, but I made a couple based on pure athletic ability alone that I was proud of. Watching the puck go by was tough, mostly because I didn't see them go by. Getting used to the mask, and looking through the cage to focus on the puck was a challenge. Every puck that hit my pads and didn't go in had me yearning for more. I couldn't control rebounds, and had a hard time knowing where the puck was when it dropped, but it was a little ego boost each time I looked in the net and didn't see pucks. Can you talk about the physical challenges? I'm sore in places I didn't know I had! Dropping down into the butterfly and getting back up was so much more exhausting than I could have ever imagined. Facing no more than 5 shots had me gassed to the point that I was bent over my leg pads sucking wind. Staying in a proper position - skates outside of shoulders, hands forward and glove up ready to make a save was just as hard as actually trying to make that save. Pushing across the crease once I was down was nearly impossible, and keeping myself from dropping down on 1 knee instead of 2 was a huge struggle. I'm not even going to mention the trouble I had getting back up if I happened to roll over on one side or the other, but a baby deer trying to stand for the first time comes to mind. What were your takeaways from an hour in net? Playing net is so much fun, but so incredibly frustrating. I would definitely try it again, but won't be hanging up my player gear any time soon. 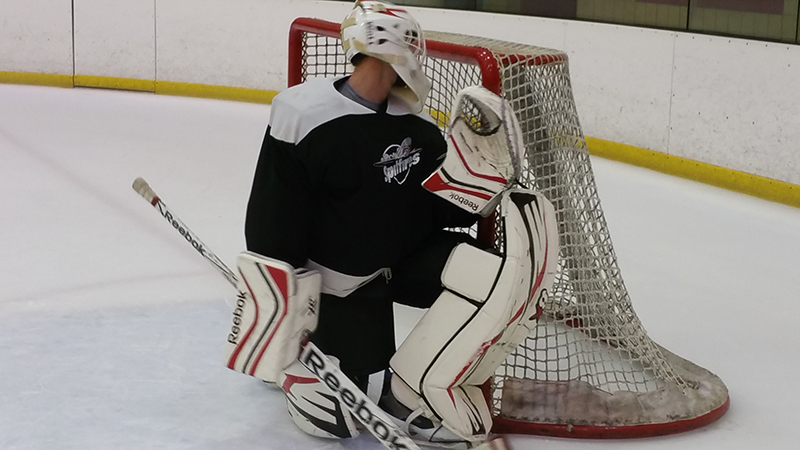 What are two things you want to share with fellow players about being in net? Never ever complain about your goalie's ability to make saves until you've tried it. Facing more than a few shots while the play is in your zone is exhausting in itself, never mind when you've given up 30+ shots to the other team. Stop going in for breakaways during warm-ups. It takes too much effort to make those saves and doesn't actually help your goalie get ready for game time decisions. Most stops they'll face will come from further out, or will have defenders there to help try to block or interrupt shots. Thanks Brian for letting me share your experience. I hope more players decide to try out being a goalie for a day. Maybe some of you will decide to stay between the pipes. The world needs more goalies.